As we cross the half-year threshold of 2016, unbearably hot and humid weather is upon us. 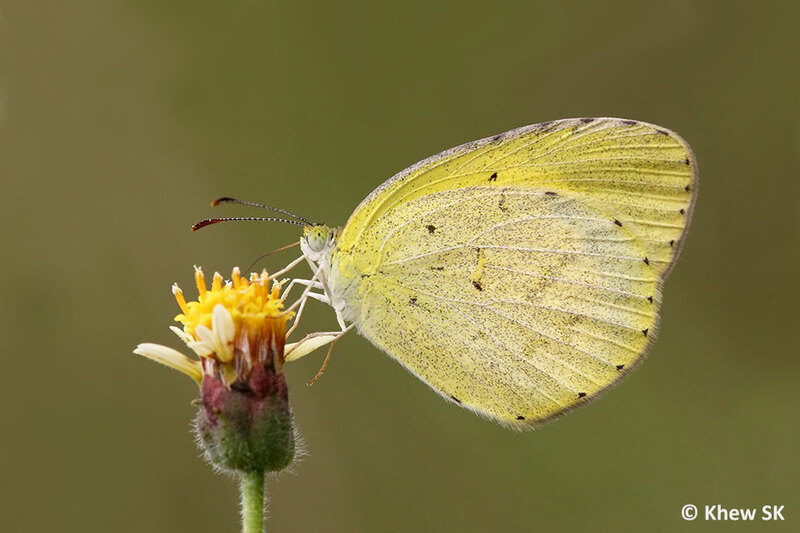 The summer weather in the northern hemisphere warms up the environment quickly, as the mercury climbs past 30degC in cities as far north as Beijing and Tokyo. A friend who just came back from the Middle East reported temperatures hitting 40degC already, and rising! Singapore's weather is no different, often touching 30degC and it is the humidity that gets to you, if you are out in the field. Fortunately, the rains that we get regularly in Southeast Asia have rejuvenated the environment, and the greenery from Singapore to Thailand have turned lush again. 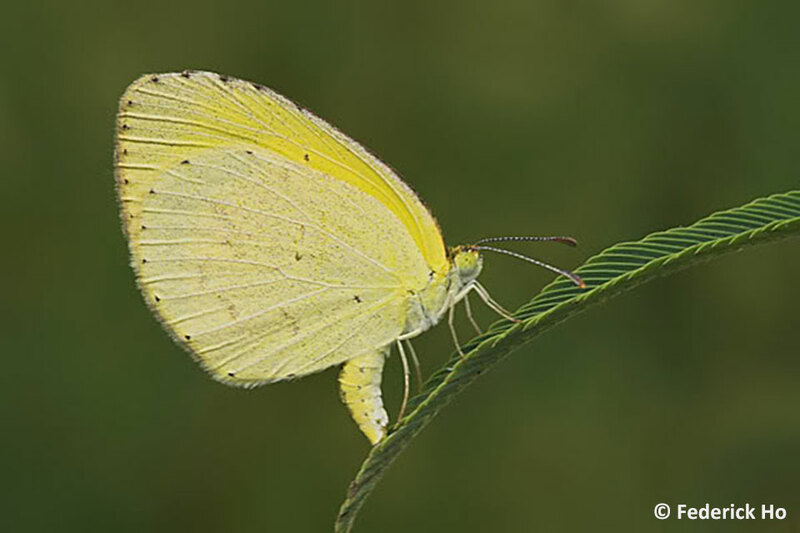 This is obviously good news for the butterflies, and it is the season for our flying jewels to be out in numbers again. Our human world, on the other hand, appears to be as tumultuous as ever. For a while over the past two weeks, everyone from the taxi driver to the kopi uncle also had something to say about "Brexit". Though I wonder if they really understand what it is all about! The Internet seems to have reached a lot more people today than we would have thought possible, compared to the newspaper era. Changes to the economic outlook in many countries are painfully unpredictable - mainly leaning on the side of bad news. Already, some countries are already talking about negative interest rates. To the layman, this means that you have to pay the bank to keep your money "safe" for you. I wonder if it would spur people to keep wads of notes in a Milo tin and hide it under the bed like my grandmother used to do! Terrorist attacks on innocent people continue to strike mercilessly and unpredictably. Just a week ago, more than 40 people perished in a shooting and suicide bomb attack at Istanbul's international airport. This morning, terrorists struck a restaurant in Dhaka, Bangladesh, leaving 20 innocent victims dead. Both attacks were attributed to ISIS extremists. One wonders when all this madness will ever end? Ironically, here in Singapore, the news that appears to have dominated mainstream and social media over the past few days, was about the raising of parking charges at public carparks. As usual, cost of living issues take centrestage when it comes to hot topics on our little island in the sun. Somehow, this pales in comparison, when we read of the troubles that our neighbours face, or the fatalities in terrorist attacks around the world. C'est la vie! 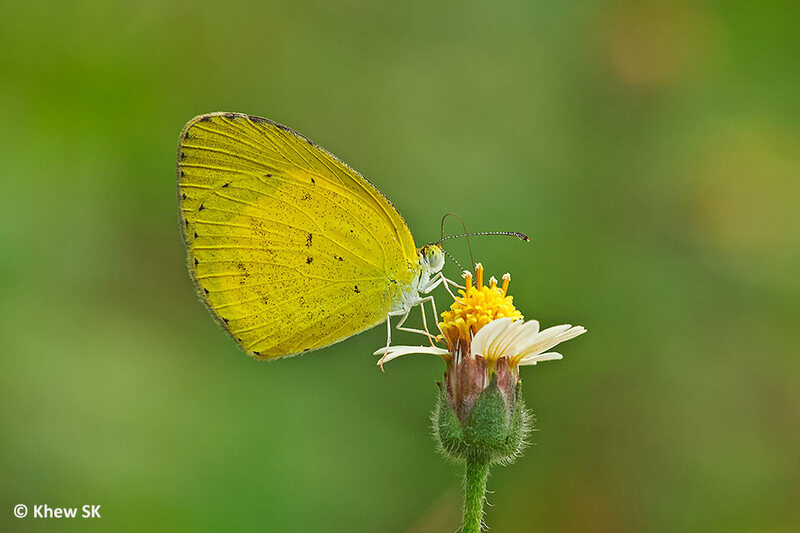 This month, we feature a bright and yellow butterfly to give a little bit of cheer to our world. But alas, even in this bit of optimism, we have a sad tale to tell. 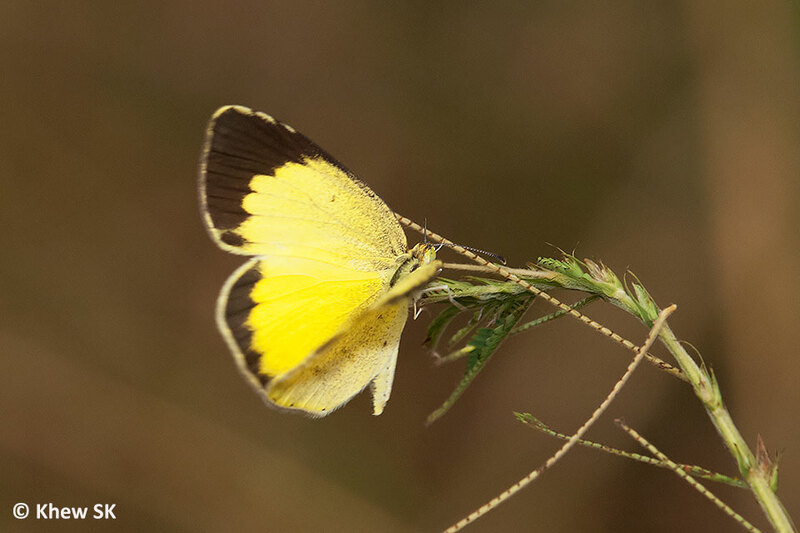 Our Butterfly of the Month is the No Brand Grass Yellow (Eurema brigitta senna). Pardon the rather unglamourous name, which originated some some literature from the region. Elsewhere, it is called the Small Grass Yellow, but then again, English Common names are never known to be a reliable source of indentification. 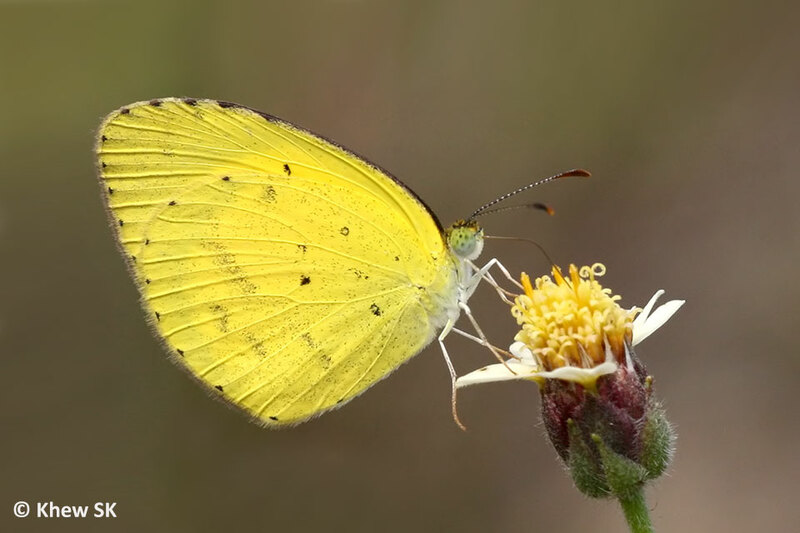 The No Brand Grass Yellow was originally re-discovered in Singapore back in Oct 2006 at a wasteland on the northeastern part of Singapore. 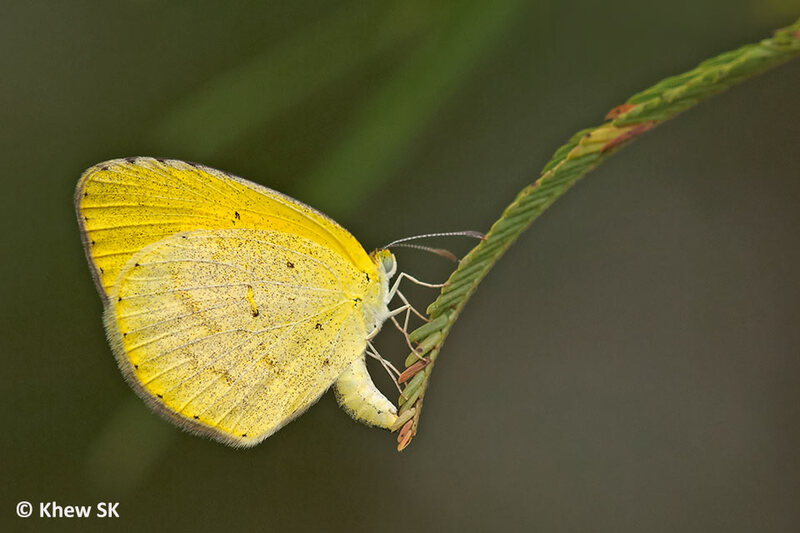 Its caterpillar host plant, Cassia mimosoides, had colonised a patch of cleared land awaiting development. 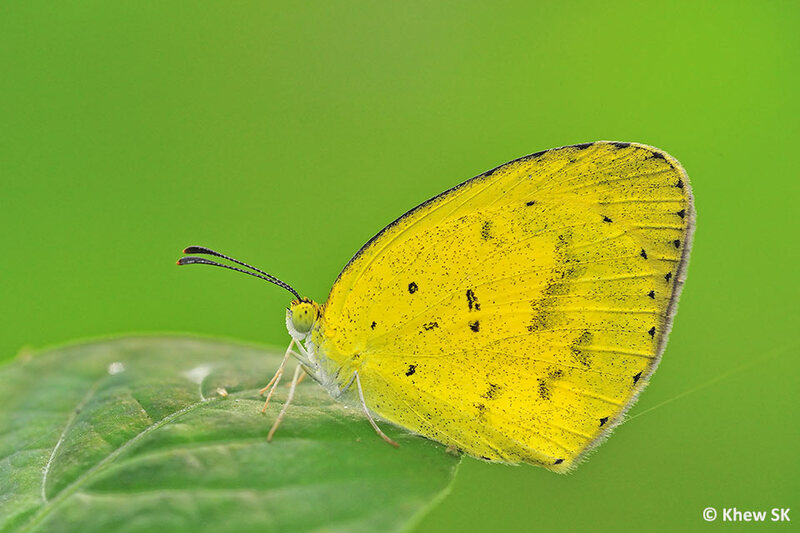 For a short period, the butterfly was almost abundant in that area, due to its short life history. 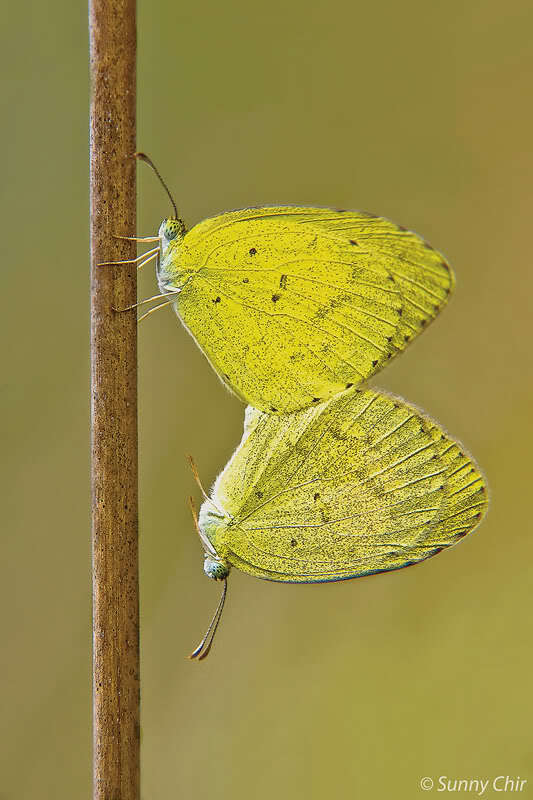 Top : Female No Brand Grass Yellow (note lighter coloured hindwing) Bottom : Male No Brand Grass Yellow (note brighter lemon yellow). Underside with more extensive brown freckles peppering both wings compared to the other species in the Eurema genus. It was last photographed from that area in late 2008, just before the excavators descended on the site and the wasteland was no more. 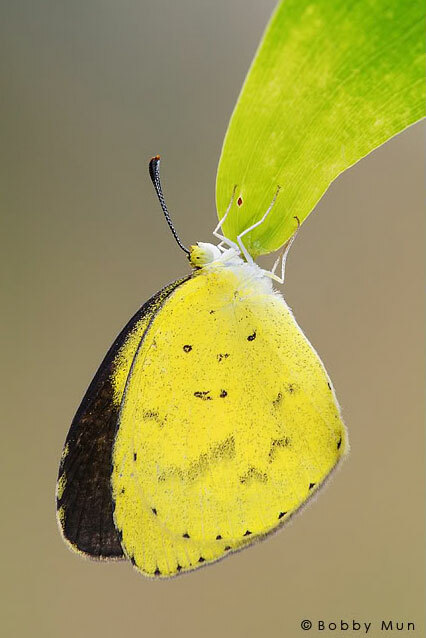 Several attempts to translocate the species to other areas failed. 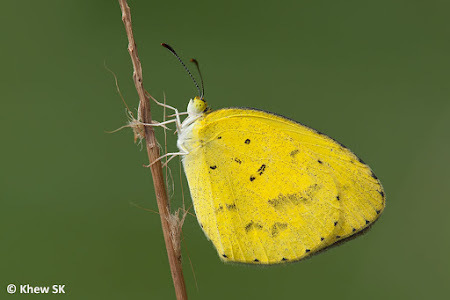 The host plant was cultivated and spread to other parts of Singapore, including Hort Park and other urban parks, but the No Brand Grass Yellow has not been seen since, except for an unvalidated sighting from Pulau Ubin in 2010. The No Brand Grass Yellow appears like its other more common cousins when in flight. The upperside forewing black borders are regularly scalloped and not deeply excavated as in the other species of the Eurema genus. 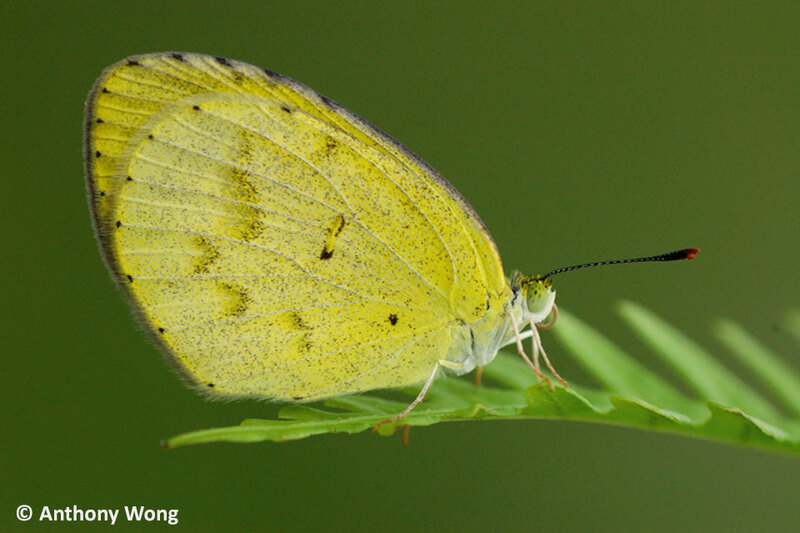 In terms of size, it is generally similar to the other species found in Singapore, averaging between 18-20mm on its forewing length. On the underside, there are no cell spots - a characteristic that is used to identify and distinguish the other species of the Grass Yellow species. 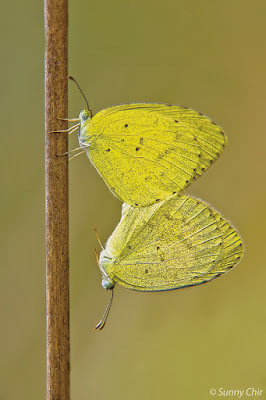 The male does not possess a brand on the cubital vein (which is present in the other species). This could have given rise to the common name of this butterfly as having "No Brand". 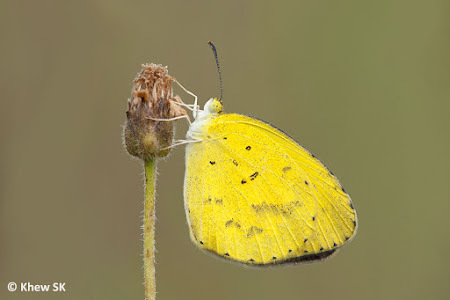 The underside of both sexes of the No Brand Grass Yellow is heavily freckled. 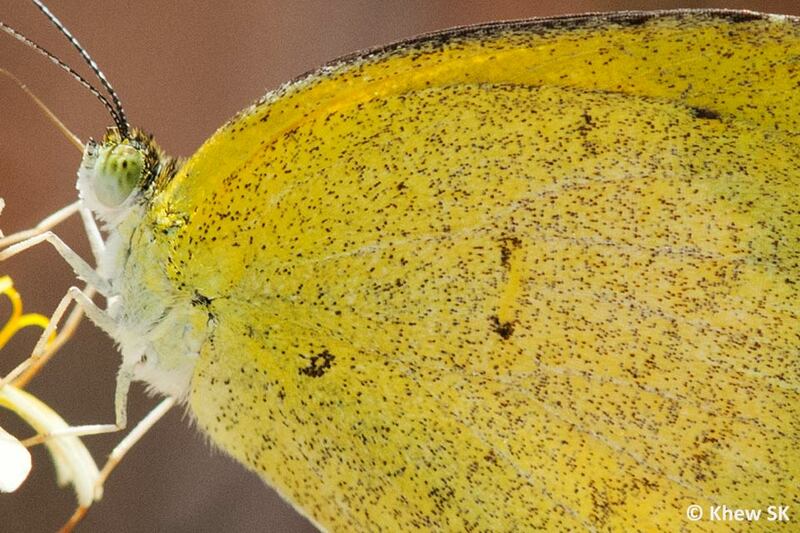 The "peppered" appearance of the underside is distinctive, and readily separates this species from its lookalike cousins. The female of this species is also unique in that the hindwing is of a paler yellow than the forewing, giving it a two-tone appearance. Fortunately, the life history of the No Brand Grass Yellow was recorded on this blog before its disappearance from Singapore. 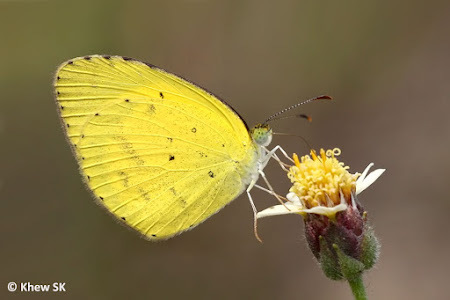 If there are any sightings of this species in recent years, please inform us by posting on this blog article, or on our FaceBook "Butterflies of Singapore" Group. Ideally, you should have a photograph of it for validation. 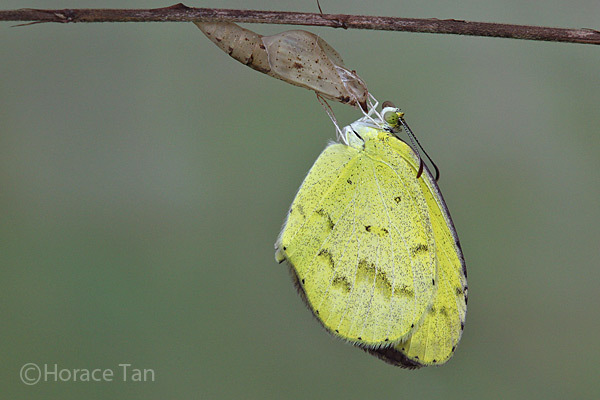 Text by Khew SK : Photos by Sunny Chir, Federick Ho, Khew SK, Bobby Mun, Horace Tan, Tan BJ and Anthony Wong.